Right clicking over previews opens a window allowing user to adjust current preview settings. - If you wish to apply current settings to all previews, select SetToAll. Once selected, every changes made to current preview will be applied to all other... Carefull !!! Section 1 - Image -> Video output, Mirror, Flip, DeBlocking, Deringing, Brightness, Contrast, Saturation, Gamma, Hue, Sharpness/Blur and Denoise. Section 2 - Audio -> Audio output, Filtering, Volume and Equalizer. Section 3 - Speed -> Display Speed and InterFrame generation (to create images that do not exist). Section 4 - Export -> Copy/Swap/Compare previews with others, Export (to Virtualdub or External Player), File operations. Section 5 - Misc -> Miscellaneous for External decoding, AviSynth source and Cropping. Section 6 - Fx -> Special Effects and 3D Stereo display (beta). Video : to disable or select video track (if there are several in current file). Subtitles : by default, no subtitles are displayed. Use this option to select subtitles. - You can for example copy current media to other previews and select different output drivers to compare outputs. - This can be a good way to test output driver for your system (according to your video card) and then defining optimal settings in preferences. Mirror : Mirrors image (horizontally). Flip : flip image (vertically). DeBlock : activate deblocking filter (cpu consuming). Dering : activate "contour" filtering (cpu consuming). - Left gauge lets you define aspect in real time (by clicking or using mouse wheel). - Right selector lets select defined formats : 4/3, 16/9... Auto : will restore A/R from original source. Image Settings : Defined image presets. Sharpness/Blur : Positive values will add precision/Sharpness and negative values will blur image. Denoise : Denoise image using 3dDenoise filter. Audio : allows to select audio track (if there are several in current file). - 2.0 Mono : Left and Right speakers play same sound. - 2.0 Stereo : Standard Stereo (Default). - 4.0 Stereo : Stereo output on 4 speakers (LeftFront = LeftRear and RightFront = RightRear). - 4.0 Multichannels : 4 channels without bass. - 5.1 Stereo : Stereo sound played on 5 channels + subwoofer. - 5.1 Multichannels : FrontLeft + Center + FrontRight + RearLeft + RearRight + Subwoofer. - 7.1 Multichannels : FrontLeft + Center + FrontRight + SideLeft + RearLeft + SideRight + RearRight + Subwoofer. Note : You must have a compatible sound system. - NoFiltering : Sound is not processed. - Compressor/Expander : Expand sound. 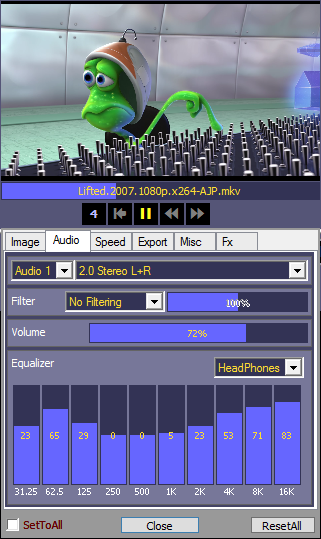 - ExtraStereo : Creates extra audio tracks. - Delay : Delay Sound. - Karaoke : reduces voice frequency sound. - Surround : Creates surround from current sound. - You may try ExtraStereo with any Audio output configuration (not only with stereo). - Filter gauge is not active yet (todo). Volume : Sets current preview volume. - This only sets current volume. Once current file is finished playing, volume will go back to last reloaded state. - Mouse Wheel can be used to set current volume. - Try HeadPhones or Bass+Trebble (good Equalizer choices). - Equalizer only affects band amplitude, not number of tracks (HeadPhones will not output sound on 2 channels). Display Speed is the same speed control found on the main GUI. ScaleTempo tries to keep real sound speed (whatever the video speed) It sometimes works, sometimes not. 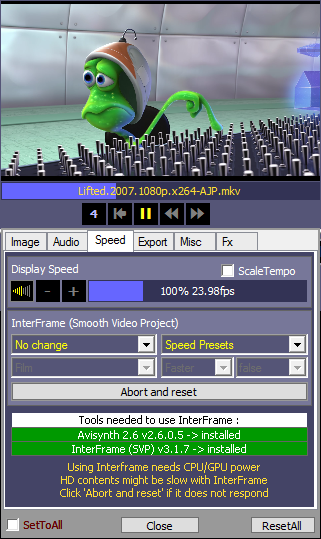 InterFrame : This features allows to "create" frames between frames. You can play a 25 frames per second movie and watch it at 50 or 60fps. - No Change : Source is left at original frame rate (this disables InterFrame). - MonitorMax : Source is converted to your max monitor frame rate : If your have 60hz monitor, movie frame rate becomes 60Hz (instead of original : usually 24, 25 or 30fps). - MonitorHalf : Source is converted to half monitor frame rate. Example : playing 23.974 fps movie will be converted to 30fps (for a 60Hz monitor). This option may be faster than MonitorMax. - SourceX2 : Source is doubled : 25fps -> 50fps. - Other values define a particular "static" frame rate. - MonitorMax and MonitorHalf are dynamic values. - Assuming you choose "MonitorMax", HamMultiPlayer will calculate 60fps output regardless of the source frame rate. 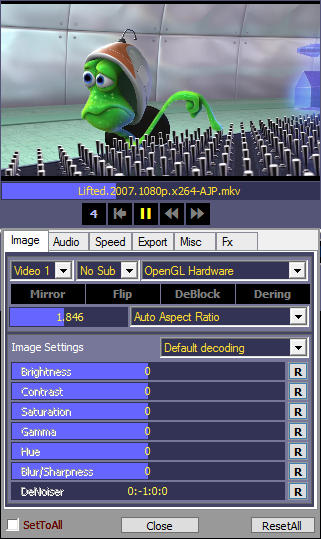 MonitorMax at 100% playing speed : 29.97fps -> 60fps (InterFrame creates two frames from one source frame). MonitorMax at 75% playing speed : 22.48fps -> 60fps (InterFrame creates almost three frames from one source frame). MonitorMax at 50% playing speed : 14.98fps -> 60fps (InterFrame creates four frames from one source frame). MonitorMax at 10% playing speed : 2.3976fps -> 60fps (InterFrame creates 25 frames from one source frame). MonitorHalf at 10% playing speed : 2.3976fps -> 30fps (InterFrame creates 12.5 frames from one source frame). SourceX2 at 10% playing speed : 2.3976fps -> 4.79fps (InterFrame creates 2 frames from one source frame). Using MonitorMax or MonitorHalf and decreasing speed is a good way to slow down motions. Others values are static, output frame rate will always be relative to source frame rate. - InterFrame : http://www.spirton.com/interframe InterFrame comes from SVP project : http://www.svp-team.com/ and it uses SVPFlow libraries. Tuning : Film / Animation / Smooth / Weak. - Film - This offers a good balance between the accuracy of individual moving things and the cohesiveness of the frame. Useful for content that was filmed or rendered (Recommended). - Animation - This should be used for cartoons/anime. - Smooth - This increases the accuracy of individual moving things while decreasing the cohesiveness of the frame. Some people prefer it since it gives the motion an overall "smooth" feeling. - Weak - This decreases the accuracy of individual moving things while increasing the cohesiveness of the frame. Sets the interpolation strength/quality. It controls the compromising between quality and speed. - Medium - Very good quality. - Fast - Faster than Medium but slightly lower quality. - Faster - Faster than Fast but lower quality (default). Whether or not to use GPU (video card) alongside CPU to accelerate conversion and improve quality. This mode may run slower. This is because while it is doing calculations much faster, it is also doing more complicated calculations to improve quality. A faster way to activate InterFrame at defined speed using current maximum monitor refresh rate. Abort Interframe and reset its settings (use it if program does not respond after few seconds). (All installed versions must be 32bits to work together). After installing AviSynth, InterFrame, FFDshow and Lavfilters, restart your computer and HamMultiPlayer should now be abble to use InterFrame(s). Load/Swap/Compare current preview : May be usefull to swap 2 medias or to load current to another for testing or comparison. - Compare -> Uses CRC32 to be sure files are identical. - Load All -> Load a preview to another preview including settings. - Load File -> Load a preview without changing current preview settings. - Load Settings -> Only load settings to another one. - Swap -> Swaps two previews. Note : Loading or swapping a preview to another one does not modify files. VirtualDub : Exports "AVS" file using AviSynth to VirtualDub. HamMultiPlayer creates "AVS" file, then search for VirtualDub 32bits and start it. 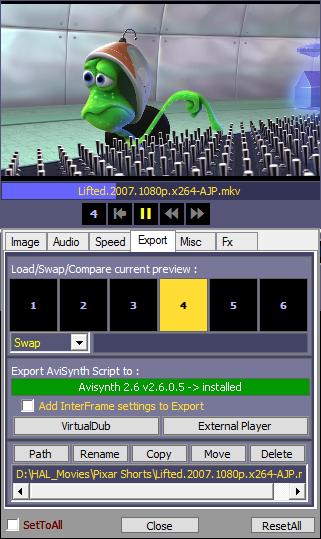 ExternalPlayer : Exports "AVS" file using AviSynth to default player. You can use it to export InterFrame settings in your favorite player and then watching movie at 60fps. This thing is similar to TV's MotionFlow effect. Image and audio settings are not exported. Only InterFrame settings are exported. - Path : Unloads preview and opens current file path. - Rename : to rename a file, type or modify its filename then click Rename. - Copy : to copy current preview file to another directory or drive. - Move : to move current preview file to another directory or drive. - Delete : to delete current file. Note : Moved files are not auto-reloaded in current preview.